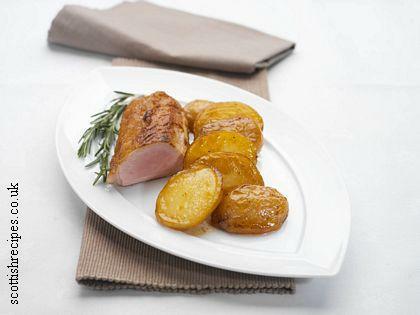 Easy to make pork recipe of mustard loin and melted potatoes with photograph, ingredients and easy instructions. This easy to make pork recipe has been kindly provided by Andrew Fairlie the two Michelin Star chef at Gleneagles in Scotland. This mustard pork loin with melted potatoes recipe will serve four. Pre-heat the oven to 200C or Gas Mark 6. Trim any excess fat from the meat. With the tip of a small knife score the fat with small lines. Rub the mustard into the fat and then season with the salt and pepper. Place the joint into the fridge for about 30 minutes. Take a braising dish and spread the softened butter over the bottom. Cut 1cm off the end of each Rooster potato and put them flat side down into the braising dish so that they are placed together but not squashed. Pour cold water into the dish until the potatoes are covered and bring the water to the boil. Place the pork loin onto a roasting tray and place into the oven. 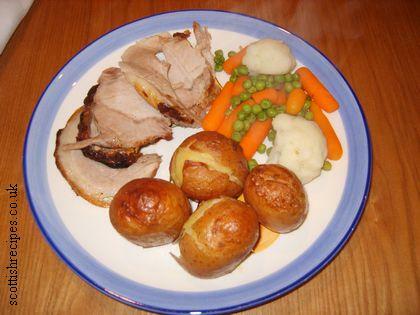 Roast for 50 minutes and then remove from the oven and set aside to rest for a further 15 minutes. The water should have reduced to dry and the potatoes should be tender. If the water has not reduced, remove from the oven and finish cooking on the gas until they are golden brown.